Esmeralda came into the collection from the family of the author Anthony Sampson. Esmeralda was originally built in 1909 and her construction is unusual with having a bow top and side windows. She is also particularly large and we think that the wheels come from a pair of recycled carriage axles. We believe that Esmeralda was named after Esmeralda Locke, the daughter of well-known Welsh Gypsy family. This girl was something of a free-spirit. She married the town clerk of Bridgnorth when she was young, but ran away with Gypsy Lore Society member Francis Groome. She could not settle with Francis either and left him to pursue a wild, free, wandering Romany life as a dancer and singer. 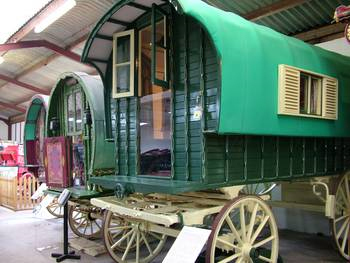 Esmeralda joined the Worcestershire County Museums’ important collection of Gypsy caravans, or Vardos, in 2008.